Thursdays 9.00am - 4.00pm. Fridays by appointment. 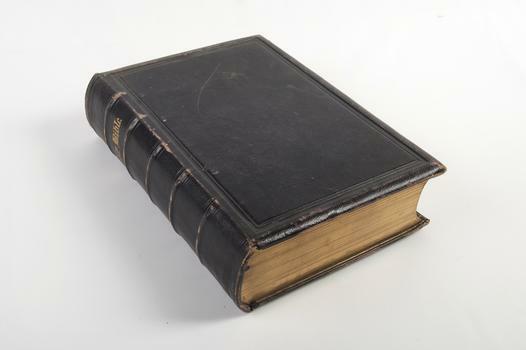 We have a fairly complete Methodist collection with significant holdings of Congregational and Presbyterian material. 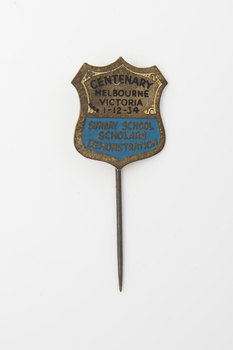 We also have a collection of Uniting Church Archives at State and local level. Is it possible to see all things and photos of the Rev PUl Mallalieu? I have a large amount of things and photo of his. 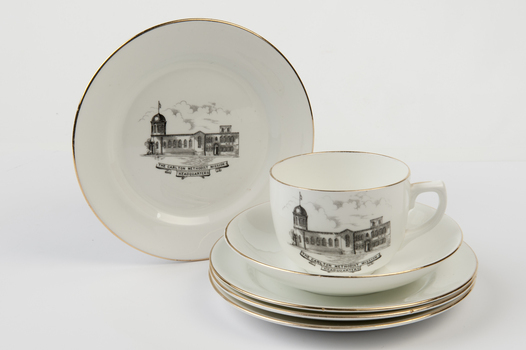 White china crockery with gold rim and grey/black transfer print of headquarters. 4 plates, registration numbers 12.3, 12.4, 12.5 & 12.6; cup, registration number 12.1 and saucer, registration number 12.2. Gloss, black and white image of Rev. 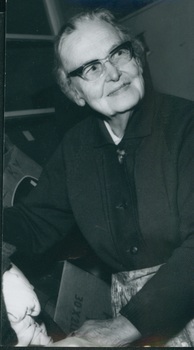 Rosalie Rayment-Hewitt. Rev. 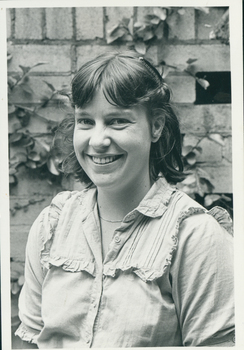 Rosalie Rayment-Hewitt was Minster of the Word at Shepparton South Uniting Church from 2008. "Rosalie Rayment, Lay pastor – evangelist with Church of Christ in Thailand (CCT) at Nakorn Sri Thammarat"
Satin, black and white, head and shoulders, studio portrait of Rev. 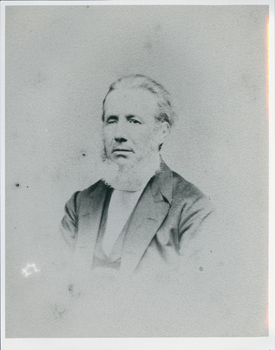 Dr. Thomas Bowman Stephenson. Rev. Dr. Thomas Bowman Stephenson (1839-1912) founder of the NCH and Wesley Deaconess Institute in 1890, President of Wesleyan Conference in 1891, and was the author of several hymns. Saimon Qaius was a prisoner of the Japanese during W.W.II. He subsequently worked for the Methodist Missionary Society as a teacher in New Britain. He assisted Rev. C. Mannering in translating the Old Testament into Blanche Bay dialect, as used by the Methodist Mission in New Britain. Flemington Wesleyan Methodist church was built on Mt Alexander Road in 1865. Gloss, black and white image of Colin Rutherford. 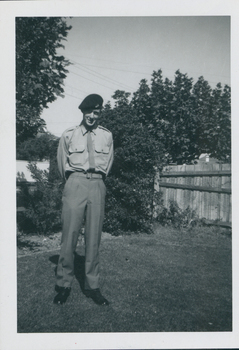 Colin Rutherford was located at Kokoda Barracks, Holsworthy NSW. 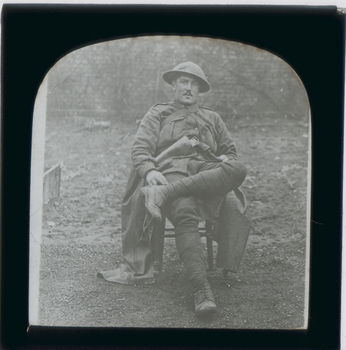 Glass negative with image of unidentified seated soldier. The soldier is wearing the Brodie pattern steel helmet issued to Australian soldiers on the Western Front 1916 - 1918. 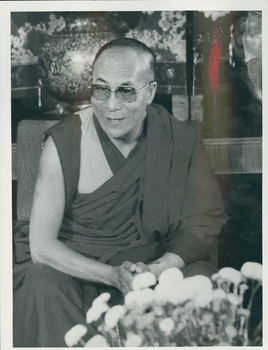 B & W waist-length seated photograph of the Dalai Lama. 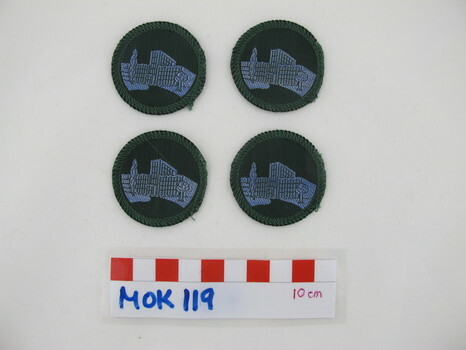 "His Holiness the 14th Dalai Lama of Tibet at Claremont College, California, U.S. in 1979"
Four round 3rd Class Social merit badges. Green background with blue embroidery. New. 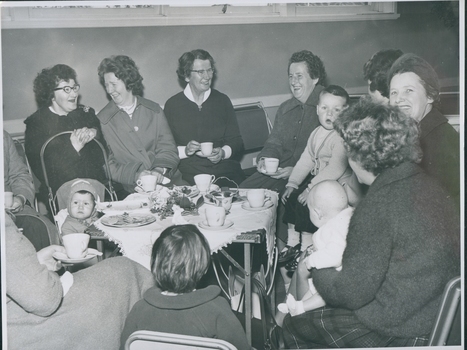 B & W photograph of Presbyterian Deaconess Jess Metherell with a group of mothers and children. "Hamilton Aikin 162 Russell Street Melbourne." Photo shows the organ, the front three or four pews, communion table, and pulpit. On the back is the name Margaret Eddy (Allan) in pencil. In ink is "With my love, Christmas 1952, Rita" and "We love the place, O God, wherein thine honour dwells." Elizabeth Buchanan worked at an opportunity shop - possibly Kildonan Care. Gloss, black and white image of Mr. Len Clarke. 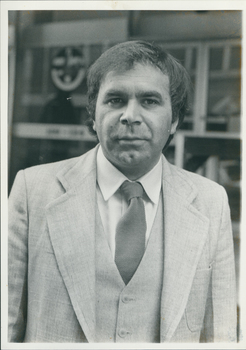 Mr. Len Clarke was Chairman of the Aboriginal Advisory Council in 1986. Small photograph album, probably 1920s, with 36 photographs, mostly of fellow students at Rolland House (as it came to be known). Hope Goldie was a missionary with the Australian Presbyterian Mission in Sholinghur, South India for thirty years from 1927 to 1957. Hope Goldie was the third child of James and Isabella Goldie. She was born in New South Wales but later returned and was raised in her parents homes town of Port Fairy in south-western Victoria. She had a short-lived career in teaching before completing a course as a deaconess at the Deaconess and Missionary Training Institute in Carlton. Late in 1927 she went to India as part of the Australian Presbyterian Mission in Sholinghur, South India. Hope learned to speak and write the Tamil language, overcame and adapted to the climate and the poor living conditions and devoted the next thirty years to living the message of the Christian gospels. After being involved in a great variety of mission work - health, education, evangelism and work with women - she moved from the mission compound to her own bungalow in a weaver's village called Ramakrishnarajupet. There she opened her (Abode of Peace), a refuge for people in need and a centre of expansion work into the villages where welfare and handcraft centres were established. Her (secret) gift of 1000 pounds was used to purchase a Fordson van to use as an ambulance and a roadside clinic. Hope's Indian co-workers included a doctor, nurses and evangelists. The building of a village church was a significant achievement for Hope. With money given by an Australian congregation she was able to purchase land and oversee the building of a church in an Indian architectural style. On completion the Poddaturpeta church was absorbed into the Church of South India and dedicated by the Bishop of Madras on 29 June 1952. In 1957, after thirty years in India, Hope Goldie retired and returned to live in Melbourne. She continued to promote the work in India at every opportunity and contributed most of what small savings she had to projects such as village wells. She died in 1964. There were many tributes from the Australian and Indian churches. Very few people were identified (or places, except for Exhibition Building) and then only by first name. Silver embossed and engraved sport trophy with engraved lettering on the front and back. The engraving on the back is the names of the winning houses for 1950, 1961, 1966, 1967, 1968. 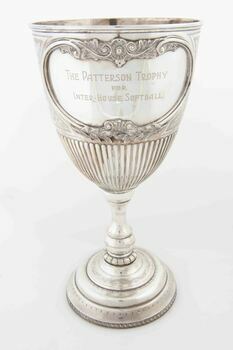 Front "The Patterson trophy for Inter-House Softball"
Gloss, black and white image of a head and shoulders portrait of Mr. James Mirams. Mr. James Mirams (1808-1885) was a guest preacher in the Congregational Church and was involved in the Anti-state-aid Society. 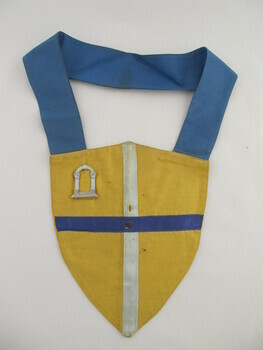 Methodist Order of Knights dress uniform shirts in plastic bags. MOK110.1 Size 11 Blue polyester/cotton permanent press long sleeved shirt with breast pockets with flaps. The shirt has epaulets and opalescent white buttons. MOK110.2 Size 12 Blue polyester/cotton permanent press long sleeved shirt with breast pockets with flaps. The shirt has epaulets and opalescent white buttons. 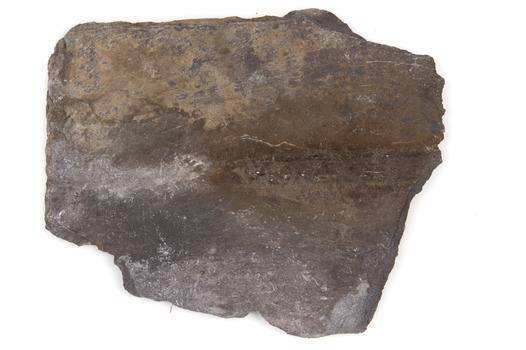 MOK110.3 171/2" 44 cm. 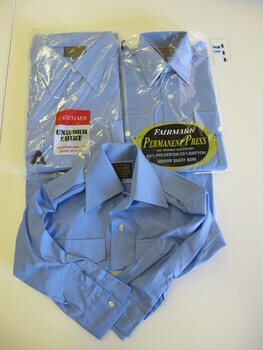 polyester/cotton permanent press long sleeved shirt with breast pockets with flaps. The shirt has epaulets and opalescent white buttons. B & W photograph of the Revs. 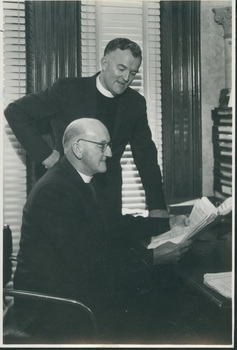 Alec W. Pederick (seated) and Andrew J. Pearce (standing) in the office of Otira Home Missionary Training College. 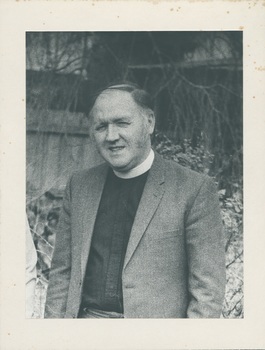 Rev Alec Pederick (1902 - 1972). Trained at Queen's College. 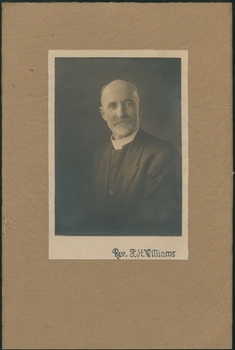 Commenced his ministry at Zeehan, Tasmania in 1927. In 1929 he went to Rabaul P.N.G. and to Piniqidu in 1931. 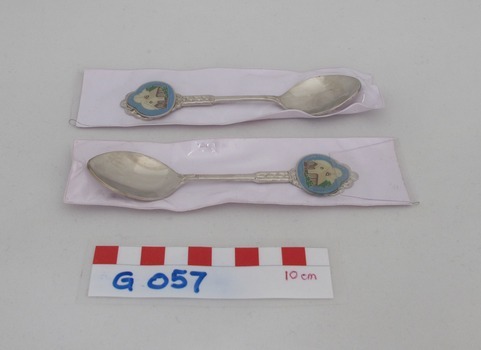 Returning to Australia in 1933 was appointed to Beaufort Circuit and then to the Methodist Home Missions Department. Served as a Chaplain in the A.I.F 1942 - 1944. After discharge from the army Rev. 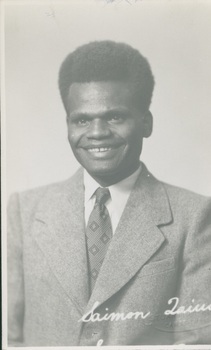 Pederick resumed working with Home Missions, becoming General Superintendent and residing at “Otira”, the Home Mission Training College in Kew, at which he was also principal. President of Conference in 1955. Died 19 August 1972. 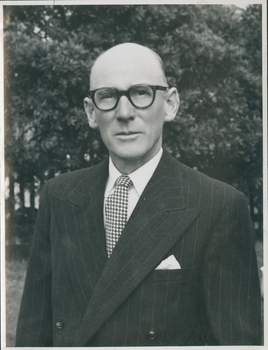 Rev Andrew J. Pearce (1912 - 1986) Entered the Salvation Army Training College in 1934. Joined the United Aborigines Mission and served 2 years in Oolea and 10 years in Finnis Spring. Returned to Victoria in 1950 and was appointed by the Methodist Church as a Home Missionary at Lancefield. Accepted as a candidate for the ministry in 1952 and appointed Probationary Minister to Colac (Elliminyt). Ordained in 1958 and served 7 years as Secretary of the Home Missions Department (1957 - 1864), 6 years as Chaplain of the Royal Melbourne and Royal Children's Hospitals (1964 - 1970) and 7 years in the Footscray Yarraville Circuit (1970 - 1977. Retired in 1977. Blue felt banner with yellow and white screen printing and gold fringing. Rays emblem in centre. On wood hanger with turned ends. 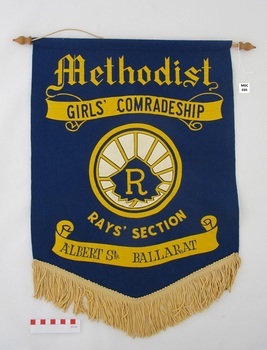 "METHODIST GIRLS' COMRADESHIP RAYS' SECTION ALBERT ST. BALLARAT"
The same man portrayed in item 272-1 albeit some years later. B. 1823 England; d. ordained 1846; d. 1896 St Kilda Victoria. 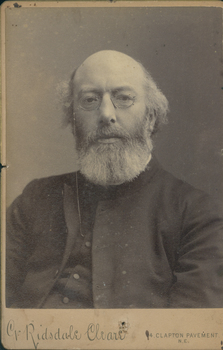 Matte, sepia, studio portrait of Rev. F. H. Williams on board with inscription. 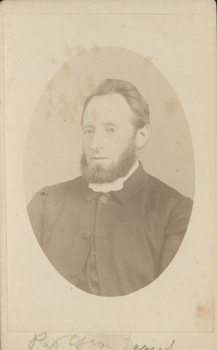 B & W waist length photograph of Mr Colne, St. John's Presbyterian Church Essendon. China plate with a raised floral border some of which are coloured. 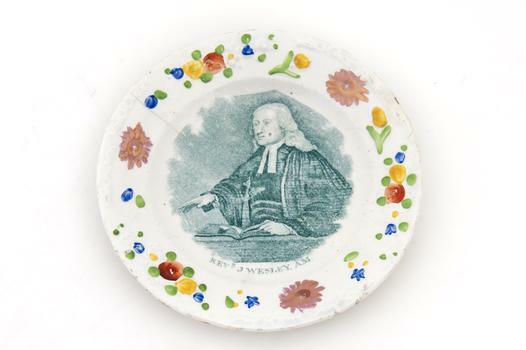 Transfer print of John Wesley in centre with text. (F375-1) Lowes standing side by side; (F375-2) Lowe standing by airport exit gate (location unknown) with a large crowd ready to welcome him; (F375-3) Lowes standing amidst the welcoming crowd; (F375-4) Lowe talking to the welcoming crowd; (F375-5) Lowe standing amidst the welcoming crowd; (F375-6) Lowe being hugged by an unknown man from the welcoming crowd. 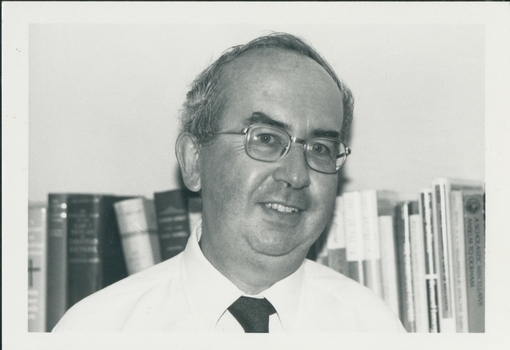 Norman Lowe's placements: Underbool 1953; Merbein 1955; Wodonga & Bethanga 1960; Immigration chaplain 1961-1962; Carlton & Fitzroy Mission 1963; Church of All Nations 1971; West Heidelberg 1974; Approved appointment Community Health Yallourn 1976. Later also Boronia, Dartmoor-Merino, and the Macedonian Church Preston. 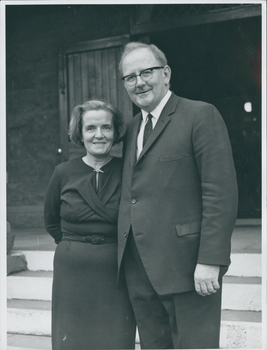 Lowe was born in 1924, ordained in 1958, and died on 11 November 2013. "The names of Norman Lowe and Mrs Lowe"
B&W head and shoulders photographs of Rev Dr Geoffrey Wainwright. Dr. Geoffrey Wainwright Professor of Systematic Theology at Duke University spoke at Independent Church on "What faces the church". "Dr. Geoffrey Wainwright Dean's Office Duke Divinity School Durham NC 27706"
B & W waist length photograph of the Rev. Peter Mackie M.A. taken outdoors and mounted on cream card. Rev. Peter Mackie was born in Edinburgh, Scotland on 13 August 1929. He was educated in Scotland. After spending 2 years in compulsory military service he entered Edinburgh University, graduating Master of Arts. His theological education was at New College, Edinburgh. After qualifying, he spent two years in Leith as assistant to the Rev. David Easton. In 1957 he married Elizabeth Dowling, an Australian. In 1961 Peter Mackie with his wife and 2 children came to Australia. In 1962 he was inducted into the Charge of Bamawm-Lockington, near Echuca. In 1965 he was called to Kew. Demitted in 1972 on the grounds of ill-health.